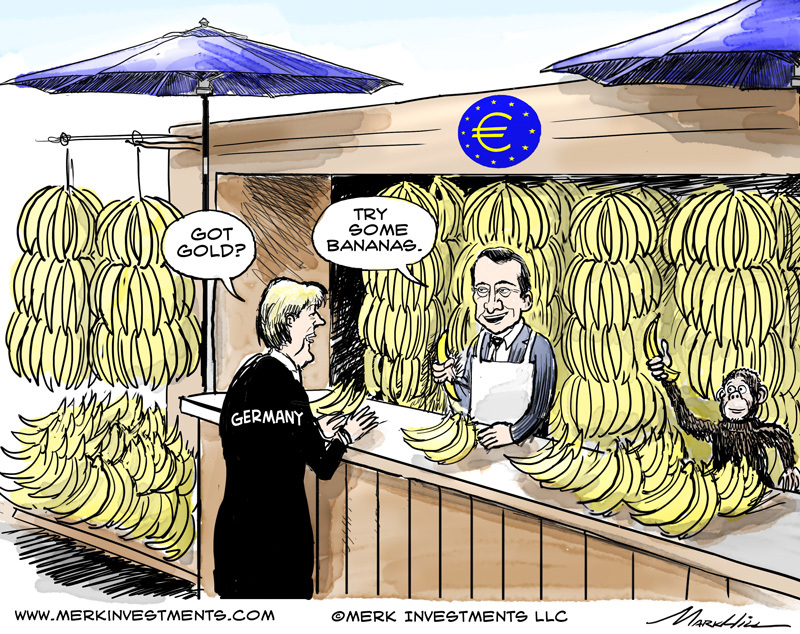 Is European Central Bank (ECB) head Draghi’s determination to purchase government bonds turning Europe into a banana republic? What are the implications not only for the euro and U.S. dollar, but gold, stocks and bonds? Our analysis shows that conventional wisdom may be proven wrong in more than one way. First some background: Draghi argues that the law requires the ECB to pursue an inflation target of close to 2%. To achieve this, he says the ECB will alter the “size, pace, and composition” of its balance sheet. A couple of months ago, he further indicated he would like to get back to the 2012 size of the ECB balance sheet. The size of a central bank’s balance sheet is colloquially referred to as the amount of money “printed,” even if no physical currency is printed. Most central banks “print” money by buying bonds (also referred to as quantitative easing, or QE). When they buy securities from a bank, they literally create the money out of thin air, as they simply provide a credit to the bank with the stroke of a keyboard. That’s what the Federal Reserve and Bank of England have done. That’s what the Bank of Japan is currently doing. When pursuing QE, central banks dictate how much money is being “printed.” The general idea behind QE is that it eases credit conditions and encourages banks to lend more. In the U.S., QE caused excess liquidity (i.e., unneeded cash) to build up in the banking system. Fortunately for the banks, they can earn some small amount of interest on that excess US dollar cash from the Fed through interest paid on excess reserves. Rather than earning interest, banks are now charged for parking cash at the ECB in the form of a negative deposit rate. If you put yourself into the shoes of a bank: why would you sell your securities for cash, unless you have a project to fund? Holding cash has become expensive because of negative deposit rates. Furthermore, because the ECB promises to keep rates low, why not hold off in accessing liquidity until there is real demand from borrowers? It should be clear, though, that the negative deposit rate at the ECB makes comparing today’s balance sheet to that of 2012 akin to comparing apples to oranges. Not content with low inflation expectations, Draghi is expected to announce a QE program this Thursday. Let’s keep in mind that anyone selling bonds to the ECB must do something with the cash. QE programs in other countries allowed banks to earn some interest on their excess cash. At the ECB, sellers will have to pay the ECB to in order to hold excess cash. As a result, sellers will think twice before selling. Having said that, at the right price, there will be sellers. However, we are now moving from apples and oranges to bananas – pardon the pun: any amount of buying by the ECB will be more potent with negative interest rates on cash deposits at the ECB, casting serious doubts over whether it is appropriate to state that the 2012 size of the balance sheet is the appropriate size. 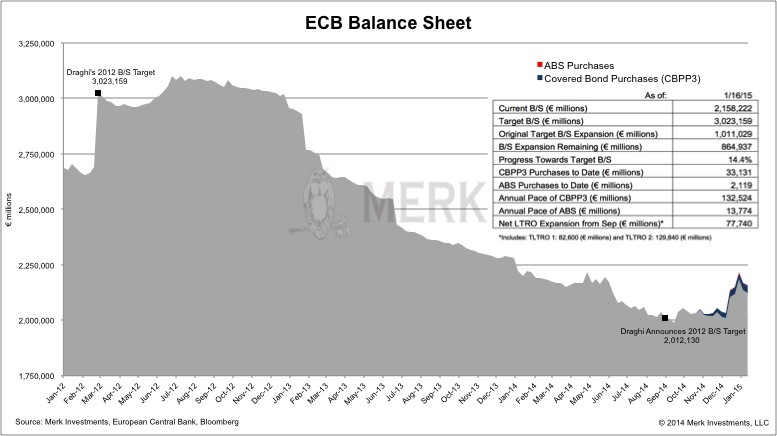 Given publicly available comments, odds are that the ECB intends to “print” approximately €600 billion trough QE, although estimates range from €500 billion to substantially higher. More likely is an open-end program where Draghi will announce a pace of purchases, then indicate the ECB will adjust the “size, pace and composition” of the balance sheet, as needed. In the past, former Fed Chair Bernanke announced new rounds of QE when inflation expectations were falling as they are today. Not now. The U.S. recovery is said to be on track; and those pesky low inflation expectations are merely a distortion in the data based on falling oil prices. In contrast, Draghi shrugs off the benefit of low oil prices and clings to the ECB’s legal mandate to boost inflation. Never mind that the ECB has said many times that a key problem preventing growth in the Eurozone is its “broken transmission mechanism,” i.e. impaired banks. While banks in the Eurozone are gradually getting healthier, the emphasis is on gradual: it takes time. With a more well-functioning transmission mechanism in the U.S., our analysis shows, should demand for borrowing pick up, inflation has a much easier time gaining foot in the U.S. In contrast, it’s very difficult to induce inflation in the Eurozone with banks unwilling and/or unable to lend. Never mind that sanctions against Russia are a significant headwind to growth. Never mind that Germany has engaged in structural reform and as a result is doing just fine and doesn’t need QE. German economic sentiment is picking up. In contrast, the laggards in the Eurozone may sorely need structural reform, but are getting QE instead. We have to conclude that Draghi is using falling inflation expectation as an excuse to pursue QE. Draghi gave what we believe is his real motivation in a press conference last summer: structural reform with a high exchange rate is politically very difficult. Namely, with a strong euro, workers have to accept lower wages to become more competitive. The alternative is to increase competitiveness through a weaker exchange rate, avoiding the difficult process of telling workers that their wages need to be cut. The backlash against structural reform has shown to Draghi – and this is our interpretation – that pain thresholds have been reached. As such, Draghi clings to the ECB’s inflation target to come to the rescue of governments. Except, of course, that the will for structural reform might evaporate when the ECB takes away the pressure for reform. While not perfect, amazing steps towards reform were taken when bond markets forced policy makers to their knees. None of that anymore, so it seems. Draghi has argued that a weaker euro would be inflationary. An implicit goal of QE appears to be to weaken the euro. Indeed, the euro has weakened from a high of 1.3993 versus the greenback last May to 1.1547 as of this writing. It should also be noted that Draghi has earned himself a reputation that he is not afraid of over-delivering. However, he faces the practical problem that European debt markets aren’t as liquid as U.S. markets. Draghi has indicated he wants to foster rather than inhibit trading; however, the Bank of Japan has all but destroyed liquidity in Japanese Government Bonds as that central bank gobbles up securities. Odds are that a quarter of the securities the ECB is going to buy are German bonds. With yields already negative for German 5 year notes, it will be interesting to see how far Draghi is willing to push them down. In some cases the ECB may be buying bonds with negative yields, thus guaranteeing a loss to the ECB. Various news stories have indicated that the ECB will also buy securities of supra-national agencies, such as the European Investment Bank. The ECB can implement a €600 billion bond purchase program; many observers –including us – doubt, however, that the ECB could dramatically ramp up that program. 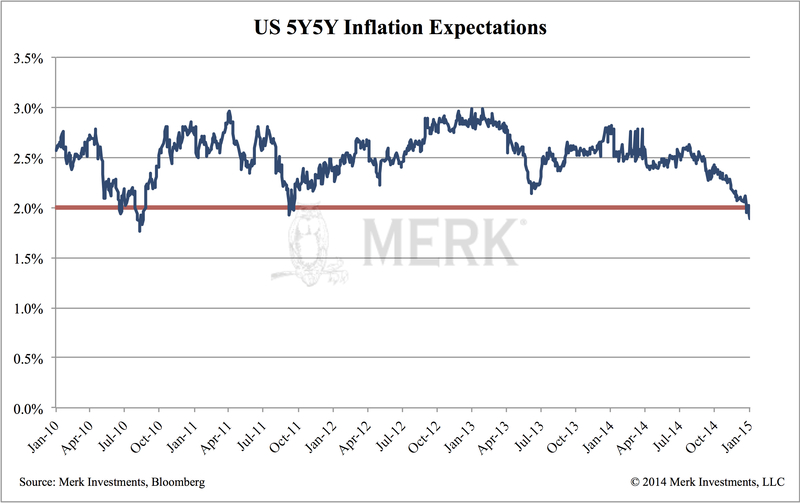 And when it comes to managing inflation expectations, the unlimited bazooka is what matters. The other practical problem is the potential political backlash against QE. On Tuesday, German Chancellor Angela Merkel spoke at an event with Draghi in the audience: "I have only one plea ... and that is aimed at all the representatives of the ECB: it must be avoided that any action taken by the ECB in any respect whatsoever could result in the impression that what needs to be done in the fiscal and competitive spheres could be pushed into the background." When it comes to QE, expectations matter. In fact, in the U.S., the announcement of QE might have had a bigger impact than its implementation. In Japan, both announcement and implementation have had an impact, although it needs to be said that the program at the BOJ is of a much bigger scale than the Fed’s program ever was. 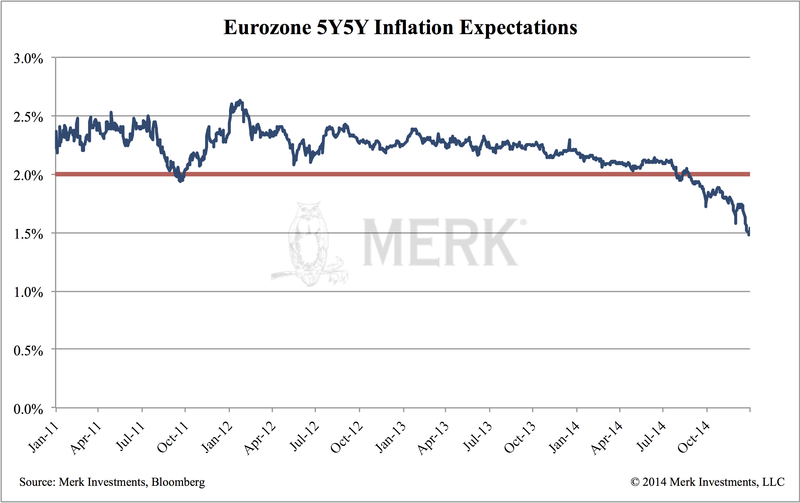 If we look at the Eurozone, the above chart says it all: the market is not impressed, inflation expectations in the Eurozone continue to fall. The hurdles listed above appear to be meaningful. In the meantime, “everyone” says the euro has to weaken. Even the Swiss National Bank has thrown in the towel. Speculative positions on the U.S. dollar show an extremely bullish sentiment. What could possibly go wrong? When exchange rates move, they do so in anticipation that a central bank “will do the right thing” – or at least the thing that’s expected of them. So if inflation ticks up, for example, a country’s currency often rises as a central bank is expected to raise rates. It’s then months later that reality kicks in and the currency adjusts downward again if the central bank is not living up to expectations. In case of the U.S. dollar, investors appear to be counting on a hawkish Fed. We call the Fed’s posturing one of wishful thinking, doubting they can be so tough in light of falling inflation expectations. The Fed’s promise to be patient in raising rates appears to signal that they indeed want to be, well, late. Not surprisingly, gold has done quite well in this environment: with real interest rates firmly in negative territory in much of the world – including the U.S., this shiny brick that pays no interest appears to be a formidable competitor. Implications for investors go much further, though: central banks may be becoming a destabilizing force. The Swiss example shows how imbalances can correct violently as policies are reversed. What happened to the Swiss franc can happen to stocks and bonds. For more details on this, please read my OpEd in the Financial Times. To dive more into this topic, as well as our 2015 outlook, please register to join us on Thursday, January 22, 2015, for our Merk Webinar. In the meantime, follow me on Twitter at twitter.com/AxelMerk for my most up-to-date thoughts on the dollar, currencies and gold.